Conventional phone headset adapter for 2.5mm headset. Do you use your phone a lot? 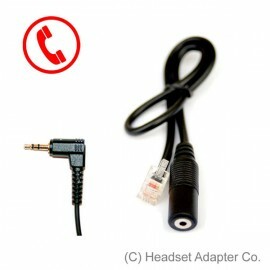 Do you want to use a standard cordless phone headset with 2.5mm plug instead of your handset? We offer you the solution, which allows you to replace your phone handset with a standard 2.5mm hands-free. Now you can have your hands free to write, type, or work with documents while be on the phone. Any conventional phone with detachable handset. *** WARNING *** This adapter does not fit iPhone or smartphone headsets. * Some "brandname" phones have proprietary signal levels and may not work with this adapter. I want to let you know the adapter I ordered from works excellent! I am using the adapter on an executone model 32 business phone system with a generic cell phone head set. It works perfect! It has been almost a month that I’ve used the adapter I purchased and my neck is improving. Thanks for your product!